Toxic cleaners and harsh chemicals are all around us. They can cause havoc with your septic system. Your septic system relies on natural microorganisms to break down the effluent which flows into your septic tank. Harsh chemicals found in many cleaners such as bleach can kill some of these naturally occurring organisms. What’s a better solution? You can make your own household cleaners out of natural ingredients you can find in your home. You can make your own drain cleaners, toilet bowl cleaners, counter spray, etc. out of natural and gentle ingredients which are better for your environment as well as family and child friendly. At this time of year, they also make great Christmas gifts, especially when decorative bottles and containers are used. Suggested uses: hard surfaces like countertops and kitchen floors, windows and mirrors. Tip: Warming in microwave until barely hot will boost cleaning power for tough jobs. Only microwave in a glass container. Mix together and store in a sealed glass jar, shelf life of 2 years. Dry soft scrubs can be made with baking soda or salt (or combination of both) with 10-15 drops essential oil to scent. Suggested uses: Use this creamy soft scrub on kitchen counters, stoves, bathroom sinks, etc. For soft water: use 1 cup soap flakes, 1/4 cup washing soda and 1/2 cup baking soda. For hard water: use 1 cup soap flakes, 1 cup washing soda, and 1 cup baking soda. Note: This recipe can be safely used in HE washers.. Tips: Add 1/2 cup white distilled vinegar to rinse as a fabric softener. For a whitener, use hydrogen peroxide rather than bleach. Soak your dingy white clothes for 30 minutes in the washer with 1/2 cup 3% peroxide. Launder as usual. Shake well before using (2 teaspoons lemon juice may be substituted for lemon oil but then must be stored in refrigerator). Dip a clean, dry cloth into the polish and rub wood in the direction of the grain. Use a soft brush to work the polish into corners or tight places. Tips: To remove water spots rub well with toothpaste. To remove scratches use 1 part lemon juice and 1 part oil, rub with soft cloth. Sprinkle toilet bowl with baking soda, drizzle with vinegar, let soak for at least 30 minutes and scrub with toilet brush. Tip: Let ingredients soak for a while to make for easy scrubbing, especially on persistent stains like toilet bowl rings. Pour baking soda down the drain and follow with vinegar. Cover and let sit for at least 30 minutes. Flush with boiling water. Tip: Prevent your shower from clogging by using a drain trap to catch hairs. Christmas can be tough on your septic system. There are the Christmas guests who come to stay. Guests bring extra water usage. Laundry increases as well as showers and bathing. The dishwasher is always running with all the extra dishes from the great, festive meals and goodies that Christmas brings. Here are some tips to keep your septic system running smoothly and avoid overuse and costly repairs. Be extra careful with water use during the winter months, shorter showers, smaller baths, etc. Ask your guests to conserve water and keep showers to a minimum. Fix any dripping taps and leaking toilet valves before winter. Check that no roof water or surface water (manhole covers should be higher than any puddles) enters the system. Buy a set of draining rods before the holidays or put them on your Christmas ‘wish list’. They are invaluable to anyone with a private drainage system and can save you a fortune when drains are blocked. Fill a plastic bottle with water and put it in the toilet tank. Make sure it doesn’t interfere with the flushing mechanism. This will reduce the volume of water per flush. Have your septic tank pumped just before the visitors arrive. This gives the soakaway a breathing space to drain away completely. Spread the washing out, using FULL loads, over a period of days. Saving all the laundry for washing day is not a good plan. Look at the labels. Only choose eco-friendly cleaning products. Avoid antibacterial soap and detergents. It can kill the good bacteria in your system. Try hand washing the greasy items in a bowl and throwing the water on the garden. It won’t harm your plants. Use air fresheners in the bathroom. If you do get a fat blockage in the drains, DO NOT use harsh drain cleaning products as they are harmful to your septic tank. Or better yet, use homemade recipes made from natural ingredients. Try using draining rods instead or call in the professionals at All Clear Septic and Wastewater Services. Prevention is the key to having a great holiday season. Be prepared and you can spend the holidays enjoying your family and friends and the magic of the season. Let Septic Preservation Services take the worry out of your holidays. Fall weather is in the air and Thanksgiving is almost here, you’re probably already making your own plans for this year’s holiday gatherings. When the holidays roll around and family comes into town – you’ll want to make sure that you pay special attention to guests in your home and how they could impact your septic system. Here are some septic maintenance reminders for the holidays. Have your tank pumped out before company arrives. If you’re having family in town or having a large event, you may want to consider having your tank pumped out before they get into town. Your tank is used to operating at a certain level based on its size and the size of your home. If you’re expecting out of town guests for an extended stay you’ll want to make sure that your septic system is operating optimally to avoid embarrassing backups or drainfield failures. Remind them about septic system “rules”. Although it might be a sensitive subject, try to educate your guests about the rules with septic systems, such as not flushing feminine products or other items down the toilet and putting food solids and grease into the garbage rather than dumping them down the drain. These things will help you to avoid backups and malfunctions and keep your system running optimally, no matter how many guests you have. Limiting the use of your garbage disposal or not using it at all is a good idea with so many different foods at the holidays. When you have guests in the town, the last thing you want to worry about is a septic system malfunction. A regular maintenance check before your guests arrive could save you lots of money compared to a septic repair and also help make their stay more enjoyable. Also, it might be a good time to review your water usage and consider changing over to High Efficiency toilets, sinks, and Energy Star appliances. Efficient use of water can improve your septic system’s operation and reduce the risk of failure. Everyone always looks forward to the holidays and getting together with family and friends. Do your self a favor and call All Clear Septic and Wastewater Services for a maintenance check to make sure your septic system is ready for the holidays and you can relax and enjoy the holiday season. What do I need to do to sell my house or build an addition on my home? If you own a home that has a private sewage treatment system in the State of Massachusetts, you are required to have a State-Certified Title 5 Inspector perform an official Title 5 Inspection on your system prior to selling your home or building an addition. What is a Title 5 Inspection? Is it possible to get an inspection even if I am not selling my home? Yes, this type of inspection is called a Voluntary Assessment. All of the same steps in the above inspection detail will be taken, however the 17-page document will NOT be sent to your local approving authority – it is for your information only. A Voluntary Assessment is a great way to find out more about your own septic system. Septic Preservation Services highly recommends this to our clients as a means of properly maintaining, upgrading and repairing your system to prolong its life. Ask us about additional services we can provide to ensure the proper working of your septic system. Can I get a Voluntary Assessment performed even if I don’t live in Massachusetts? 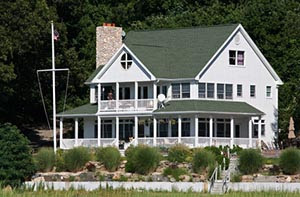 Yes, Septic Preservation Services is also certified to perform inspections in the State of Rhode Island. Should I get my system pumped or cleaned before I get an inspection? Absolutely not. The State of Massachusetts requires that your system be inspected under “normal use conditions” for a minimum of 2 weeks or more. If your system needs pumping during this period, we can arrange to have it done for you while the components of your system are exposed. Will my landscaping be affected by the inspection? The SPS team is very respectful to the landscaping of your home or property. In order to minimize the amount of physical work required to perform your inspection, we use state-of-the-art locating equipment that helps us to locate your system components within a 4-inch radius. We also use a specialized “sewer cam” to let us inspect your pipes without having to dig them up. Any sod that needs to be removed is cut carefully and laid on tarps so it can be neatly replaced when your inspection is complete. Visit www.septicpreservation.com for all your questions or call 877-378-4279. We are happy to talk to you and put your fears to rest.